I finally managed to stop cleaning today and got down to a bit of serious work, largely because I was now on a serious deadline. Somehow from the moment I awoke I was just in the zone. Such a good feeling and possibly something to do with Simon Cowell telling me he loved me (as a friend) in a dream. Strangely empowering…Anyway, it was one of those days when it got to 5pm and I realised I hadn’t eaten. Now let me explain something: I can count on maybe 2 hands and half a foot the times this has happened to me in 4 decades. Of course, what the level of hunger usually means is that incredibly bad choices are made. I almost went out for a pizza but writing this blog is making much more happy to cook. It’s an odd thing really but maybe doing it alleviates slightly the mini-heartache of cooking just for one. On that note, I did check out the blog of theartofeatingalone.wordpress.com. Jeez is she a bit sad or what? “37 year old woman with not a man in sight” is how she describes herself. Has done one posting as far as I can see. Presumably from the desert island she is living on. May I reiterate, I am not that woman. Life is for living whether you’re single, coupled up or in some other dysfunctional miasma of humanity. Brush the sliced courgette with a little olive oil and grill until golden. To make the dressing whisk the garlic and olive oil together and add lemon juice to taste. Dress the courgette and peppers with the dressing and add a little chopped anchovy if using. 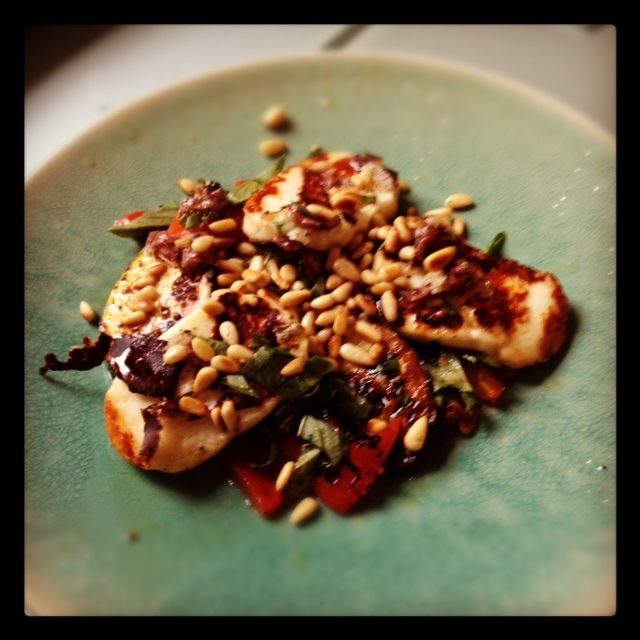 Pile on a plate with the haloumi and sprinkle over the pinenuts and plenty of shredded basil. Three things I’m rarely without – a jar of chargrilled peppers, much more economical and tasty and making your own IMHO. Ortiz Anchovies – simply the best. No arguments. And haloumi which lasts for months in the fridge.